"We have now reached an interesting centre, in former years the capital of the Island. The town stands at the foot of Castle Hill. The Parish Church (St. Mary’s) contains some interesting monuments. The tower is of the Perpendicular style, with staircase turret and pinnacles, and it contains a peal of eight bells. This is one of the churches which were founded by William Fitz-Osborne. The register, which dates from 1577, contains an entry announcing the sailing of the Spanish Armada up the Channel at the back of the Island on the 15th July, 1588. 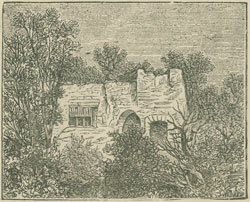 In 1859 the remains of a Roman Villa were found near the Vicarage, with interesting relics of the Roman occupation. This place is well worth a visit. The Bible Christians have a place of worship at Gunville, which is close by, and the Primitive Methodists have a Society at Carrisbrooke. The Cemetery, established in 1858 at a cost of £3,000, should be visited. Near the Cemetery is the Roman Catholic Convent of Our Lady of Reparation, belonging to the order of St. Dominic. This noble building was erected in 1866 by the Countess of Clare. The Castle is the great feature of Carisbrooke. It is replete with graphic and interesting historical reminiscences. 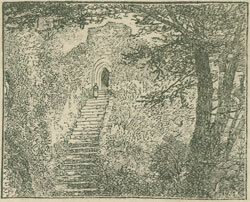 It is believed to have been a strong fortress prior to the Roman occupation. It is first mentioned, however, as having reference to the year 530, when the Saxons under Cedric stormed and took it. In parts it has undergone more modern renewal, and bears traces of the work of the Normans. We have no room for voluminous details of its early interest. More modern history is sufficiently interesting for us while we are on pleasure bent. 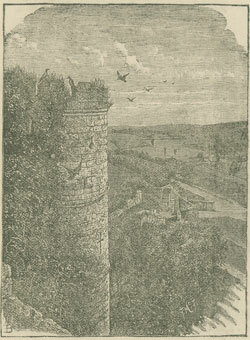 King Charles I., when pursued by Cromwellians, placed himself under the protection of the captain of the castle, Col. Hammond, who was the nephew of his Majesty’s chaplain, and who, he thought, on that account, would screen him. Hammond however, was in the interest of the other party, and he took good care to secure his royal prisoner. The king found he was in a trap, and on two occasions tried to get out, attempting to escape a window of which we give a representation. 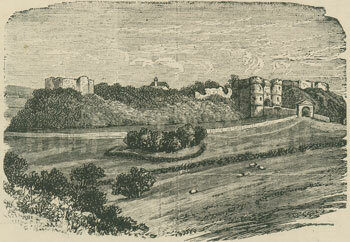 Fourteen months the king remained a prisoner, and one of his popular employments was playing at bowls on the green at the back of the courtyard, now used on fete days as a cycle track, race course, &c. He also read a great deal during his confinement in the castle. On the 30th November, 1648, he was taken to Hurst, thence to London, where he was tried and beheaded. The Princess Elizabeth, who was also a prisoner in the Castle, was found dead in bed one morning, with an open Bible at her side. Her body was interred in the Newport Parish Church, where a monument to her memory was erected by Queen Victoria. 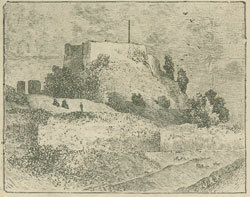 The Castle keep, about 60 feet wide at its base, is raised on a mound, which is between 50 and 60 feet high, and is approached by means of 71 steps. In the court yard is a room built over a well 150 feet deep. It contains about 20 feet of delicious water, which is raised by a donkey in a round treadmill. Some splendid views are to be obtained from the castle. 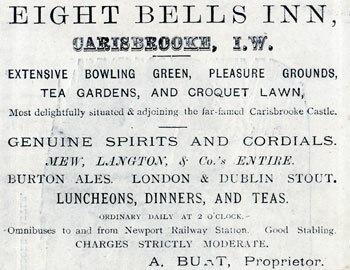 Carisbrooke is the first calling station after Newport on the Newport and Freshwater Railway. Letters come through Newport for delivery at 7 p.m. and 2 p.m., and are dispatched at 8.25 a.m., noon, and 6.30 p.m. The wall letter box near the Waverley Hotel is cleared at 6.30 p.m., Sundays, 12.30. For the present we will pass the capital and take a run down to Cowes, passing through Parkhurst, and leaving our visitor, if he please, the option, en route, of looking into the King’s forest there, the barracks, the Isle of Wight union workhouse, or the convict prison—a nice combination forsooth. If he goes by train he will pass Dodnor, stopping-by-signal station, and again pull up at Mill Hill, a suburb of Cowes. "